It took one bite of Boudin sausage for me to realize I knew nothing about the best taste of Louisiana. Sure, I’ve eaten my way through New Orleans and assumed that I’d gotten the gist of gastronomy in the state. How wrong I was. Luckily, Lafayette set me straight. I was a guest of Lafayette, Louisiana Tourism Board but as always these opinions are my own. Set back from the main road, you first notice the building’s tall columns and stately southern style but set your assumptions aside. Cafe Vermillionville isn’t stuffy at all. 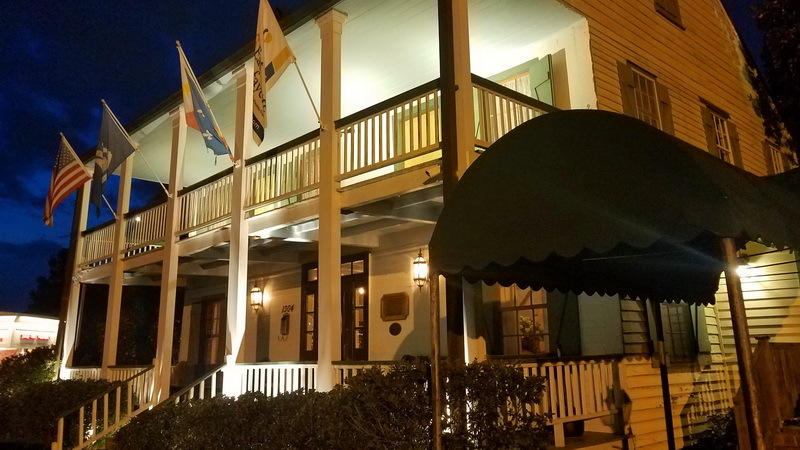 The place has had more than nine lives serving as an inn, a Civil War infirmary, antique store, private residence and bar before the current owners Ken and Andrea Veron transformed it into the kind of toe-tapping tasty spot that both locals and visitors enjoy. When the weather complies the band sets up on the side patio. 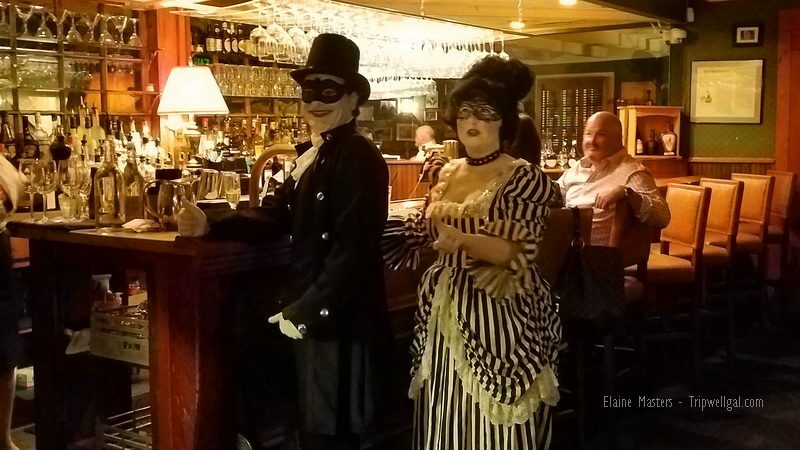 I visited Verillionville on Halloween night and the costumed crowd was serenaded by a zydeco band. Ken and Andrea were dressed for the holiday as Colonial period ghosts. “We don’t talk about them too much. Things happen. Let’s say we have partners.’ It’s a spirited spot nevertheless and when you step into the bar don’t miss the illuminated bottle collection. Many of the miniatures belonged to Ken’s grandfather. The restaurant is located just outside of downtown. For all its accolades the French Press Chef Justin Girouard keeps his creations modest. He’s drawn the best out of the old printing press space, keeping the tall ceiling open, highlighting the textured walls and framing old letterpress boxes. The warm tones and spacious seating area complement the menu inspired by local specialties with international touches. I was knocked out by the Pecan Bacon! Other accolades include Saveur Magazines’ Top 100 Inspiring Places and Things to Eat, as one of Urban Spoon’s Top Restaurants in the country and Girouard is a James Beard nominated chef. Located in downtown Lafayette. Even if you have an aversion for spicy food the island culture and the Tabasco Pepper Sauce Factory are well worth an afternoon’s wander. The tour spares little in the process from growing the seeds to grinding and the mash warehouse is enormous. The gift shop is notable for carrying varieties of the famous sauce that are unavailable elsewhere (except for their website.) Avery Island is rich in history, not the least of which is the fact it sits on a salt dome and has been valued for that since Native Americans used the resource for trading. Today the dome continues to keep the factory there as curing the mash with salt is instrumental in the process. Is Tabasco the best taste of Louisiana? Next to the gift shop is the Tabasco cafe and cooking class kitchen. You can make your own Bloody Mary’s at the buffet bar and order a casual lunch. Better yet, sign up for a class with Chef Lionel Robin. He’ll let you in on quite a few secrets that will lift his selected recipes off the page and into foodie heaven when you try them at home. It’s an entertaining hour and of course, no one leaves hungry. Tabasco cooking class chef, Lionel Robin. 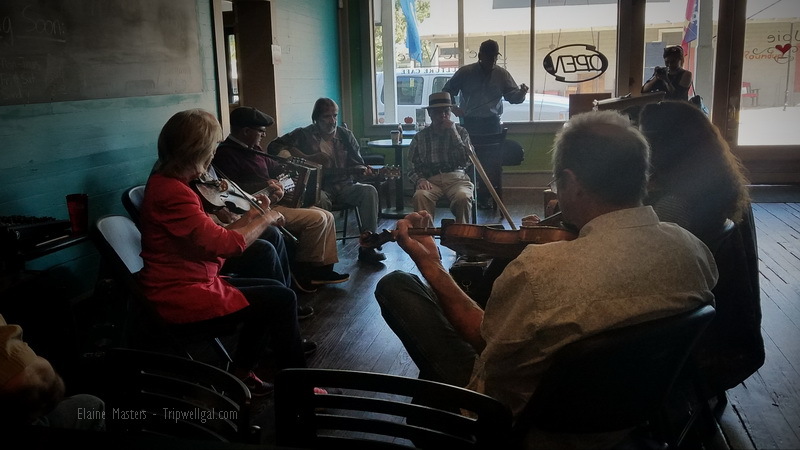 For over thirty-five years some of Louisiana’s best musicians have taken the stage for free Friday evening performances in spring and fall. No need to get gussied up for this night out. From Karaoke to fine local bands the stage and dancefloor are busy most nights of the week. Of course, you can tap your toes in between games adjacent to both sides of the stage. A little too lively? There are private rooms upstairs for VIP’s to watch. Breaux Bridge is a short drive from central Lafayette. Buck and Johnnys has settled into the space of the old Domingue’s Motor Garage. Old motor signs cover the walls and on Saturdays, the place rings to the beat of live music. Well before noon, the dance floor fills with expert to novice dancers and the food, of course, is fantastic. Look for the hand-painted sign saying “Boudin Today” on St John Street and slip in to pick up the family-made special. Sausage casing is filled with plump, soft mixtures of rice, spice, and meats. Johnson’s offers some of the best in the region but you can also order stuffed grilled cheese biscuits, gumbo, smoked BBQ made on site, and wash it all down with Swamp Pop. There’s an outdoor patio for dining but plans are underway to enclose it for customer comfort year round. Check out weekly specials on their Facebook Page. 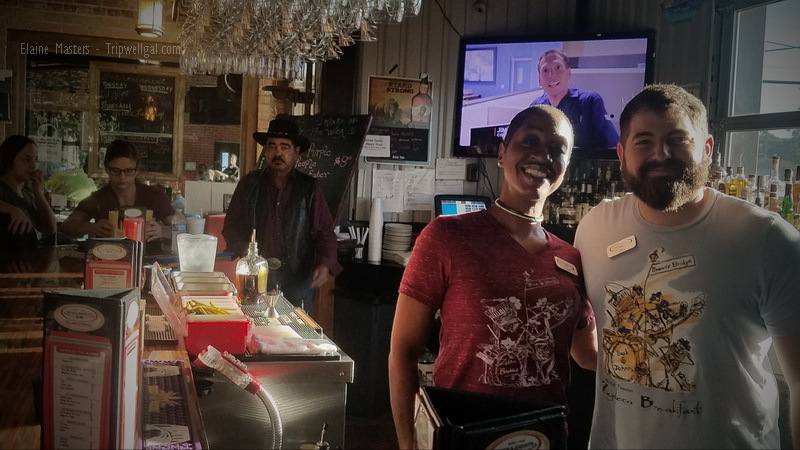 The town of Scott in Lafayette Parish is renowned and Billy’s makes it easy to pick up a meal or supplies for cooking your own local recipes. The Cracklin’ selection is unparalleled. 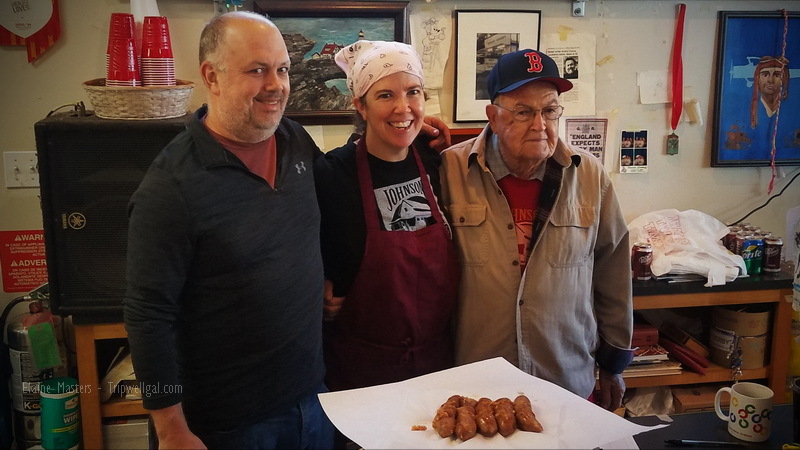 Foodies around the world have Laura’s on their bucket list after Anthony Bourdain and Andrew Zimmern raved about her food. The family traditions continue with generous ladles of gravy and fried chicken, delicious sides and pie too. Portions almost overflow which is one reason everyone is served in take-out containers. Today Laura’s daughter, Madonna gently keeps the line moving and the staff on their toes. The plate lunch tradition started when rural meat markets cooked their unsold cuts and sold them in portable and affordable plates. With everything swimming in tasty gravy working class meals were nutritious and filling. How lucky we are that lunchtime menus across Lafayette offer new takes on the fare. Find a list of other establishments serving plate lunches here. Date nights and special occasions have many places in Lafayette. The Pamplona Tapas Bar has a full menu of delicacies utilizing local seafood, farm fresh ingredients, classic Iberian cured meats alongside locally grown fare. 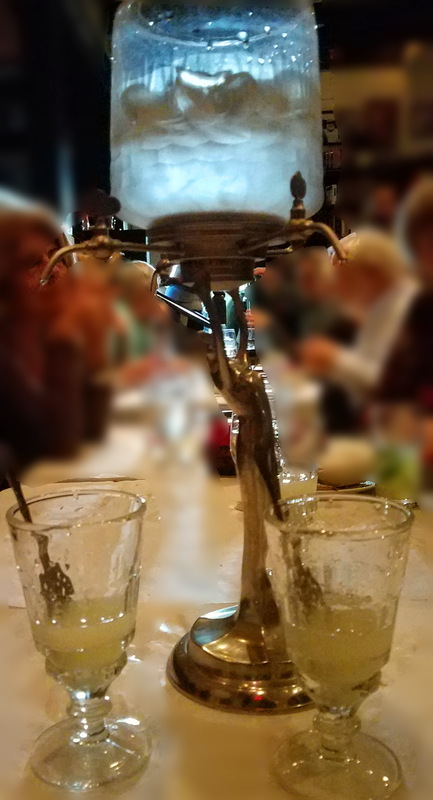 The Absinthe ritual must be experienced to be believed. 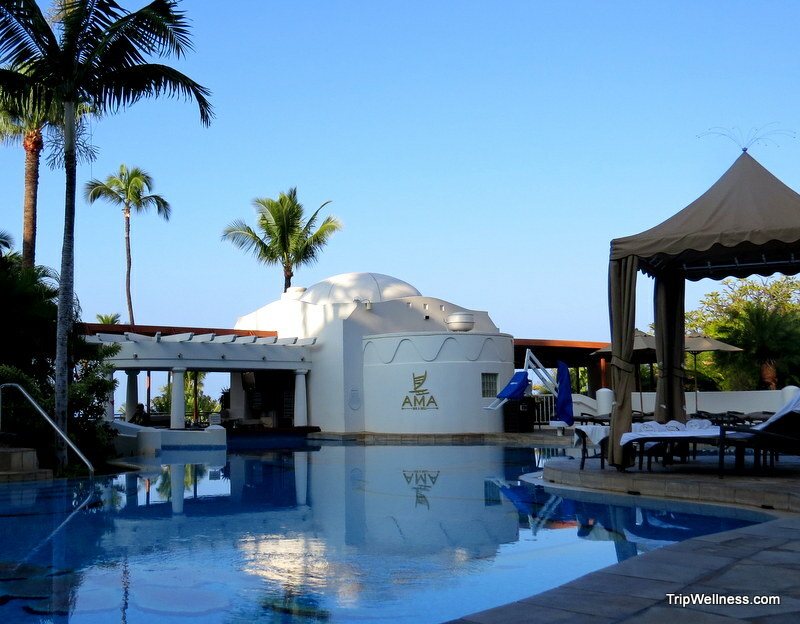 You won’t be surprised by the old world Spanish influences if you know a bit of the region’s history. Spanish invaded the Louisiana area before the British sent soldiers north from the Caribbean. Spain invited the Acadian people, once exiled to Canada from France, to settle in the area in the hope they’d help them fight off the English. The Acadians adapted to the areas unique challenges – swamps, alligators and snakes – much better than the Spanish and melded cultures as Cajuns. 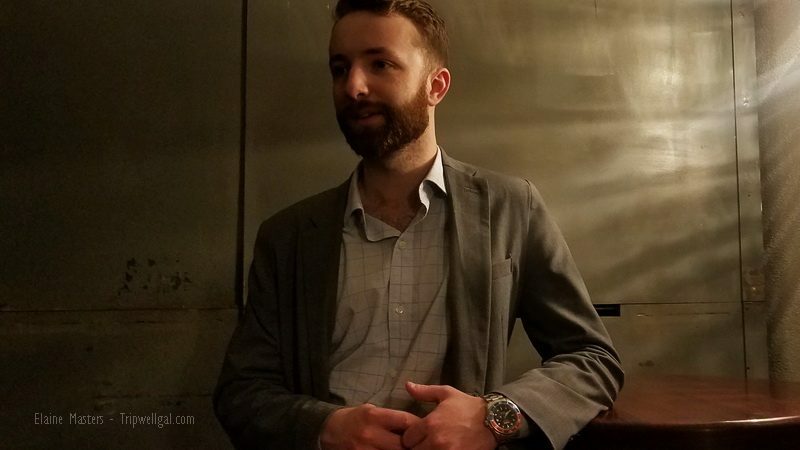 With Chef Ryan Trahan, winner of the Louisiana Seafood and American crown, at the helm of the new menu, Blue Dog has been garnering raves for it’s Cajun cuisine. 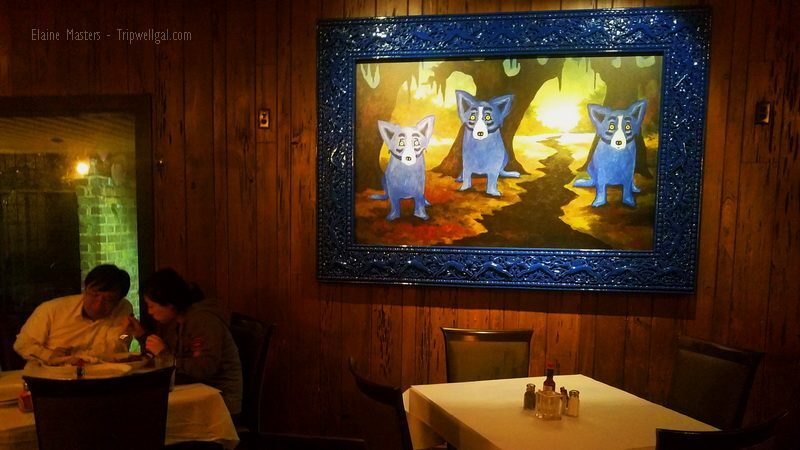 The spacious and invitingly dark restaurant is decorated with the art of Rodrigue, whose series of Blue Dog paintings made him an international legend. His sons run the restaurant today. The manager inside the Sainte Marie private dining vault. Somehow finding a gorgeous dining room and bank vault, private dining space inside the Rock n’ Bowl building seems perfect. Lafayette has such deep traditions but so much young energy. 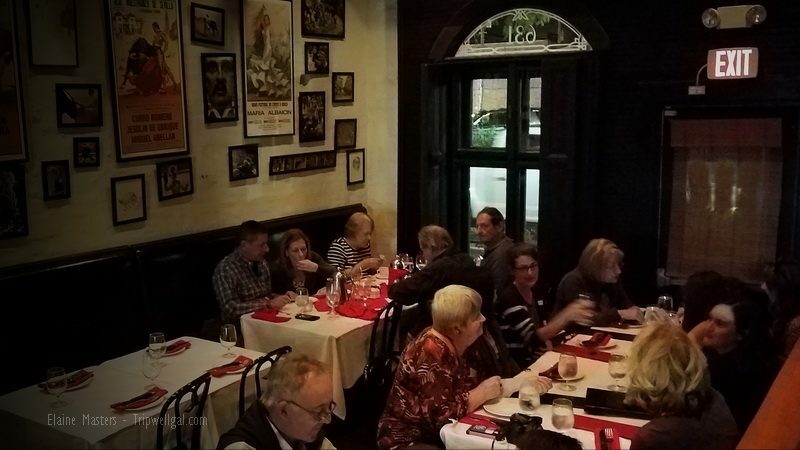 No place embodies it as well as experiencing a meal at Sainte Marie. First of all the space is gorgeous. A creative collection of vintage chandeliers hang over the dining rooms and the party room upstairs. The bank vault brass is dressed in dancing shadows from more glass fixtures. The food matches this ambitious beauty as well. The menu has elegant French entrees as well as Thai specials and of course, an emphasis on the best of Gulf seafood. Save room for dessert as the Fried Bread Pudding Po-Boy has won Best of Show Awards twice in New Orleans. Savor the graceful dining, the bowling lanes down the hall will be there when you’re done. I hope you enjoyed this taste of Lafayette and will share the bounty. This tasty tour was made possible by Lafayette Tourism and IFWTA. All opinions and pictures are my own, of course. Bon Appetit! 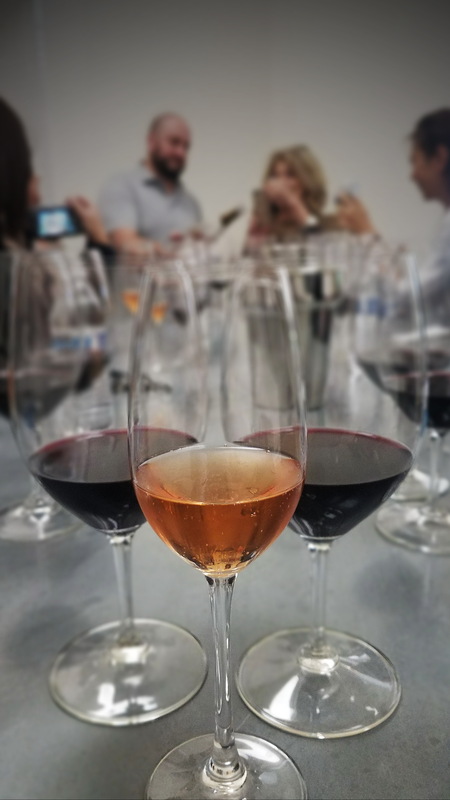 My Somm wine shop offers locals curated wine options. I used to travel to Lafayette for business in the 1990’s and ALWAYS enjoyed the food. I’ve had some amazing meals at Cafe Vermillionville. But like everywhere, it looks like Lafayette has been busy growing and adding to an already amazing list of restaurants. I would love to try some of the ones you list here, particularly Sainte Marie. Next time I drive to NOLA, I think I’ll be making a detour! Lucky you being close enough to make a detour to Lafayette. So, I have to know – how was Louisiana for Halloween? I’ve driven through the state a lot for work and have always wanted to stop and explore more. I do get to go back to NOLA in February and I can’t wait! I imagine there were some wild Halloween parties in Lafayette but it was our first day there after traveling in from around the country and Canada. We didn’t go trick or treating. I would love to go to Avery Island and see the home of Tabasco. For some reason I always thought this sauce came from a particular state in Mexico. I really love the tiny tiny bottles that you can take camping. You’re sitting over a plate of eggs you just cooked up thinking meh thoughts and then you find one of those little beauties in the bottle of your mess tote. SCORE! (or as the say in Mexico GOOOOAAALLLLL). 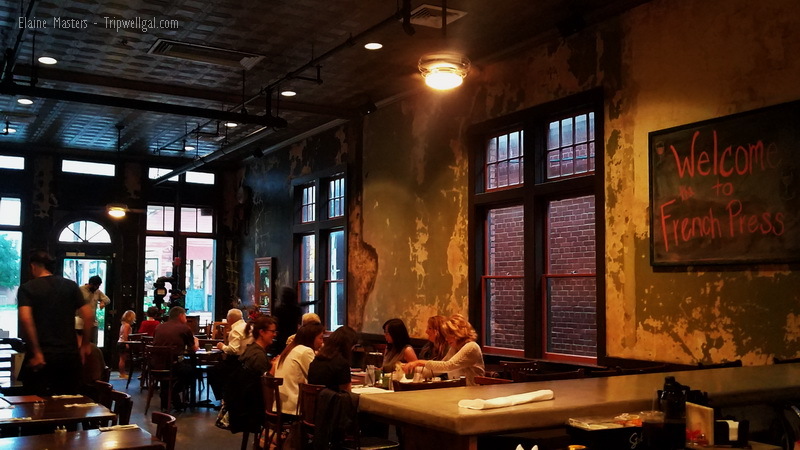 It looks like Lafayette has a lot of good eats to above and beyond Tabasco. Oooo. I can imagine those eggs with Tabasco! Avery Island was incredible. Hi Elaine! How are you? I don’t believe I’ve said hello since I saw you in Quebec. I loved this post, mainly because it pointed out how much I’ve yet to discover in my own backyard. 1) I’ve been wanting to visit New Orleans forever and still haven’t. 2) I’m a Bay Area native and don’t think I’ve spent any time in Lafayette. That being said, WOW! It looks like there are so many incredible places to feast, take cooking classes (YES to hot sauce!) and listen to live music. When I visit the Bay again I need to go to that Blue Dog Cafe. I have a journal stored somewhere in my folks’ attic with that blue dog on it, filled with musings and drawings from my first year at UCLA. It looks like you made some incredible memories on this trip. Hope all is well! So good to hear from you, Cristina. Definitely made great memories and discoveries. You must return! Very cool about finding that journal too. Happy holidays! Wow… you guys ate really well! I have never been to Louisiana or really that area of the USA at all. I’m sure I would eat my way through it, just like you did, though! We had an incredible time and there’s still so much more to discover. I’d return in a heartbeat. Thanks, Ami. I’m now a Tabasco acolyte! The chef was a fine teacher and so funny. Now if only I can convince my family to try Tabasco ice cream!! It’s bedtime and now I’m hungry. So interesting that so many of these places made over historical buildings that weren’t restaurants at all. What a great way to preserve the history. There are some tasty sounding dishes in this post. Those grill cheese biscuits certainly got my attention. Sorry to make you hungry! 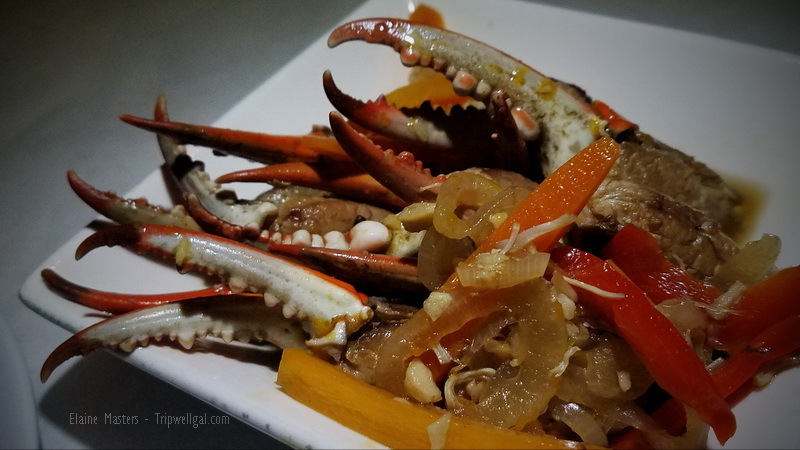 I know that experience… So much good food in the region and history. I love this post! 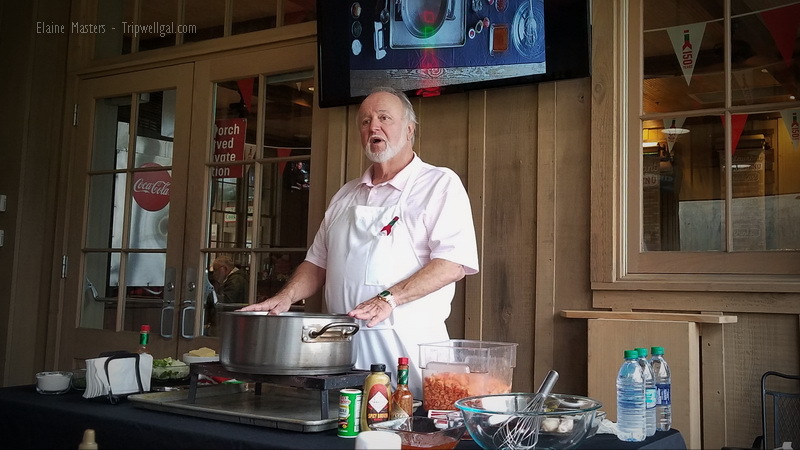 You mentioned some of the great experiences I had in Louisiana over the years — like the Tabasco cooking/tasting. Boudin sausage. Other spots I didn’t know about, but can’t wait to try next time I’m down there! 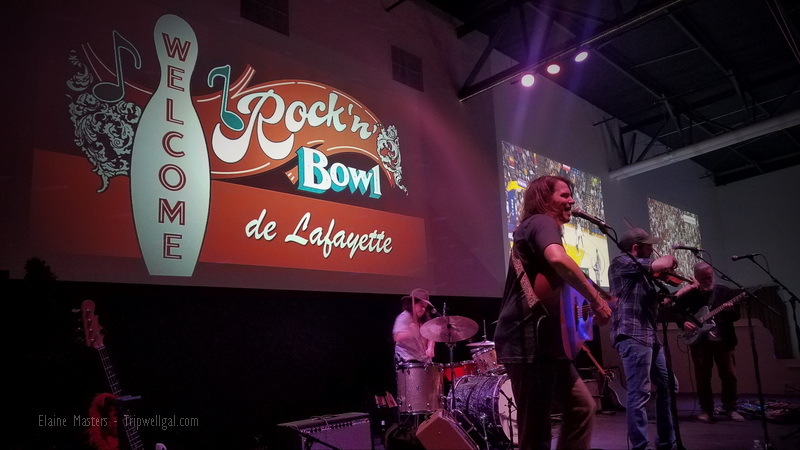 We also went to Rock ‘n Bowl and listened to Zydeco. Such Louisiana flavor! Glad to hear that you had such fun in Louisiana too. Yes! Lafayette has revived downtown beautifully and the outlying villages are following along. I love the food in Louisiana because you get the great combo of Creole, Southern, and seafood! My hubby is a sucker for good boudin and would go nuts in Lafayette at Johnson’s Boucaniere. I’m so glad that Southern food is having a revival! 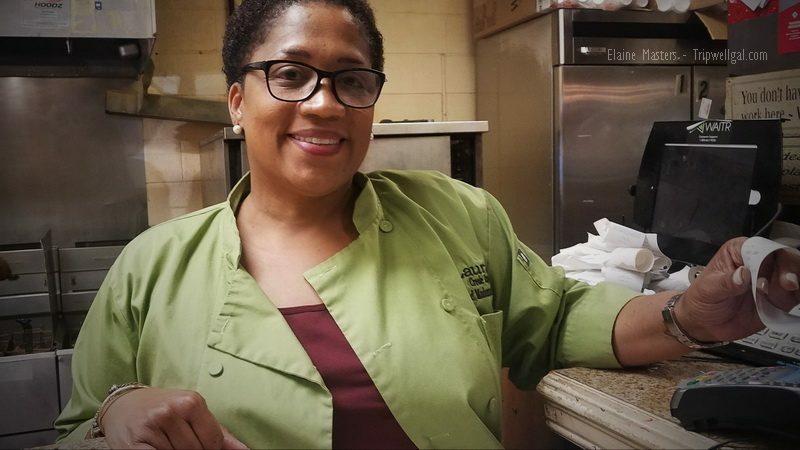 To think that I assumed fried chicken and grits were the heart of Louisiana cooking! Shame on me. The region is a gastronomic gem. If Anthony Bourdain and Andrew Zimmern recommend the plates at Laura’s, it’s good enough for me. Lafayette seems like such a fun and laidback place to indulge in my favourite activity … eating. Thanks for the tips. It’s definitely fun and the living is high-style to casual. Lafayettians know how to have a good time. Oh nice! I didn’t know that Tabasco is from Louisiana! I’ve always thought LA means Los Angeles, lol! I’d love to visit Tabasco cafe and try the cooking class kitchen. That should be fun! Lots of misconceptions were shifted during my few days there – all for the better. What a tasty tour of Lafayette. You got me with the boudin, followed closely by the creativity you describe of French Press. Laura’s also sounds like an unmissable stop as well. 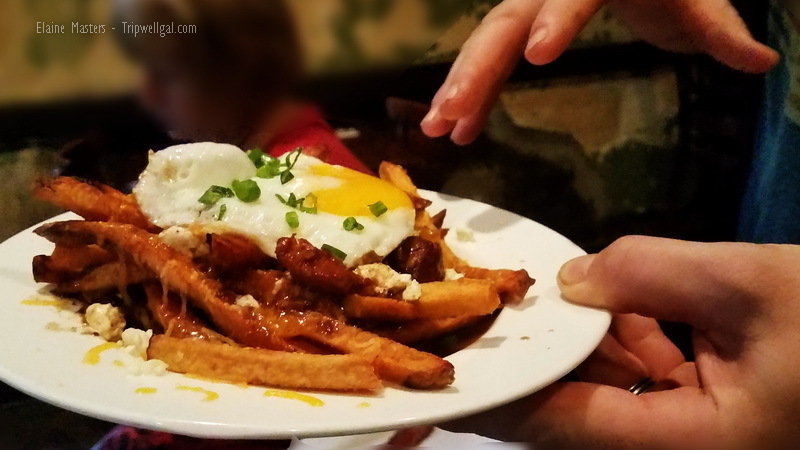 I have to say, I’m pleasantly surprised by how food oriented Lafayette is…and I love it! You two definitely need to visit Lafayette. I haven’t been to Lafayette or had Boudin sausage. 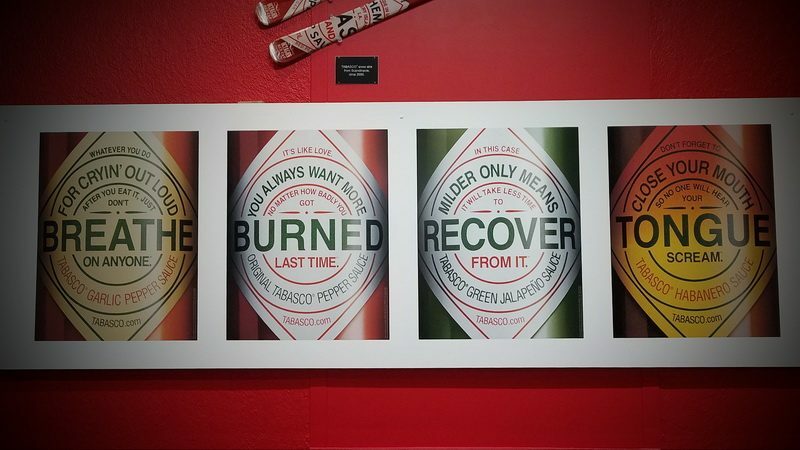 I have a friend who is all about hot sauce, this would be a fun long weekend trip with a stop at the Tabasco Pepper Sauce Factory. I hope you and your friend make a trip of it soon! This town has it going on and I’d return in a heartbeat to explore more. Salut and I hope you do have several sips soon!